Constant-velocity joints (aka homokinetic or CV joints) allow a drive shaft to transmit power through a variable angle, at constant rotational speed, without an appreciable increase in friction or play. They are mainly used in front wheel drive and all wheel drive cars. Rear wheel drive cars with independent rear suspension typically use CV joints at the ends of the rear axle halfshafts, and increasingly use them on the propshafts. 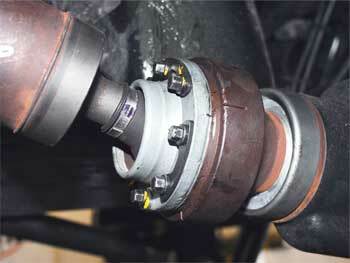 Constant-velocity joints are protected by a rubber boot, a CV gaiter. Cracks and splits in the boot will allow contaminants in, which would cause the joint to wear quickly.